Who served from September 1950 to March 1972. He earned his nickname “Boom” during tours in Vietnam and Korea. At only 12 weeks, Boom quickly followed in his mother’s paw-steps and it was evident he would become a terrific Service Dog. He was quickly acclimated to public life, making appearances at such a young age. Diesel taught him well in that most times, no one even knew there was a such a young puppy underneath the table. 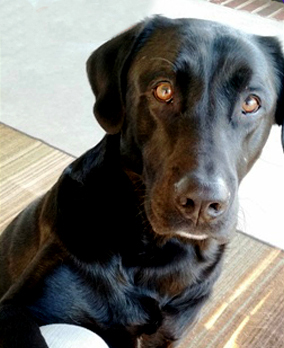 Now much older, Boom surpassed all expectations as a Service Dog during a flight across country in March 2014. It was a long, tiring mentally exhausting week with Mary’s Dad in the hospital. Boom was there to comfort all members of the family and knew when it was appropriate to approach the hospital bed to give a quick hello to Mary’s Dad. All the Delta Airline representatives and the TSA Staff in the airports were so impressed with Boom’s behavior and composure, often noting that it was nice to see a “real” Service Dog for a change. Boom knows when he is working and when it’s time to play. He and Diesel assist Steve by helping to roll him over to get out of bed in the morning, help support him walking down the stairs and provide a lot of much needed goofy-ness when the stresses of daily life get too much for Steve. Boom has also tuned into Mary’s Type 1 Diabetes and will alert her to a low or high blood sugar. Boom was influential in training other Service Dogs including Artie and Jersey. He is protective of the puppies and will not let them get out of hand during play time. He will continue in this role and continue to make his appearances in public as the face of Big Paws Canine with Diesel.